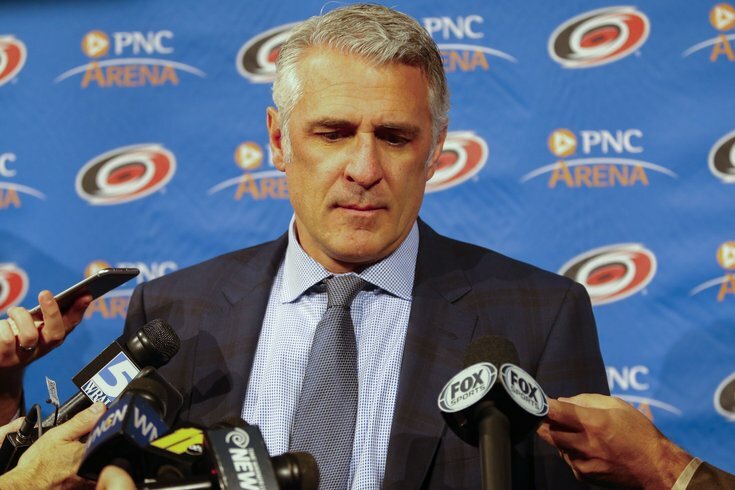 Ron Francis could be the Flyers' next GM. If you're reading this you know the news, the Flyers need a new GM. Not more than an hour or so after news broke of Ron Hextall's ouster from heading Philly's front office, NHL insider Darren Dreger had two pretty good candidates (not named Joel Quenneville) in mind. The Flyers, first and foremost, are looking to head in a new direction. Five years of Hextall brought with it no winning, little roster change and a plummeting interest in the team. Perhaps Hextall can be thanked for lowering the team's following enough that Gritty was born — but he left little by way of legacy. If indeed Philly decides to hire Chuck Fletcher or Ron Francis, here's a brief look at both. Fletcher has a long hockey resumé but the two stops most worthy of knowing about are his three years in the Pittsburgh Penguins front office, prior to nine seasons as the Minnestoa Wild GM. Not fired, Fletcher's contract was not renewed this fall. He has helped lead Minnesota, an expansion team, to six playoff appearances in a row as the team's second ever general manager. Fletcher is currently an advisor to the Devils, a team which hired him because of his experience taking teams from the bottom and turning them into playoff contenders, as he did with the once lowly Wild — who now have the second longest active postseason streak. Francis is best known for being a winger in the NFL, scoring 1,798 points over 23 seasons. He entered the front office world shortly after retiring in 2004, and ascended to the job of GM of the Hurricanes in 2014. Carolina has not had more than 86 points or made the playoffs since Francis took over, and he was let go back in April. He is a part owner of the Canes, but as mentioned earlier he is in the process of divesting, which implies he is looking to continue his front office career elsewhere. In taking over the Flyers front office, whomever is the next GM will have an interesting dynamic to fill. The team is clearly heading in a new direction, and has some really talented players on both the NHL and minor league system rosters. But the hierarchy of management is perhaps not the easiest of situations for the next guy coming in. #Flyers fans have been critical of the so-called "faceless corporate overlord" running team since Ed Snider's passing. It's my understanding that Comcast Spectacor CEO Dave Scott played a central role in Hextall's ouster, wasn't just rubber stamping a Holmgren decision.